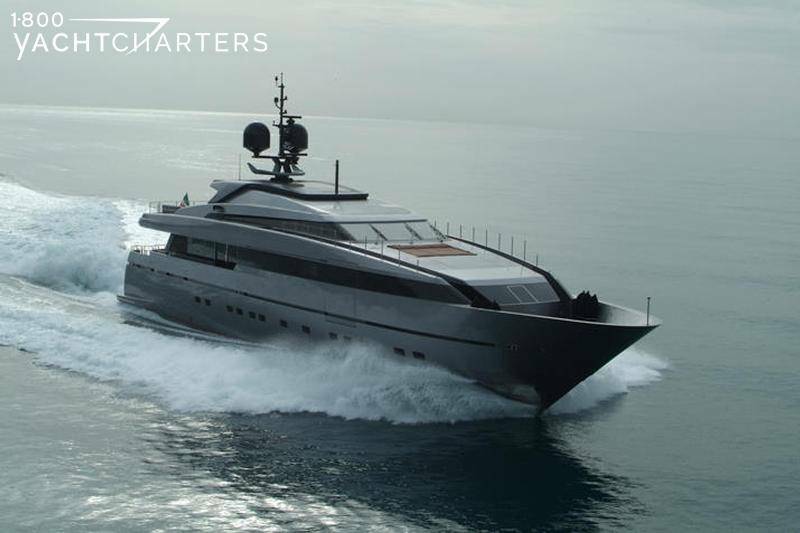 4A Running - a real head turner! 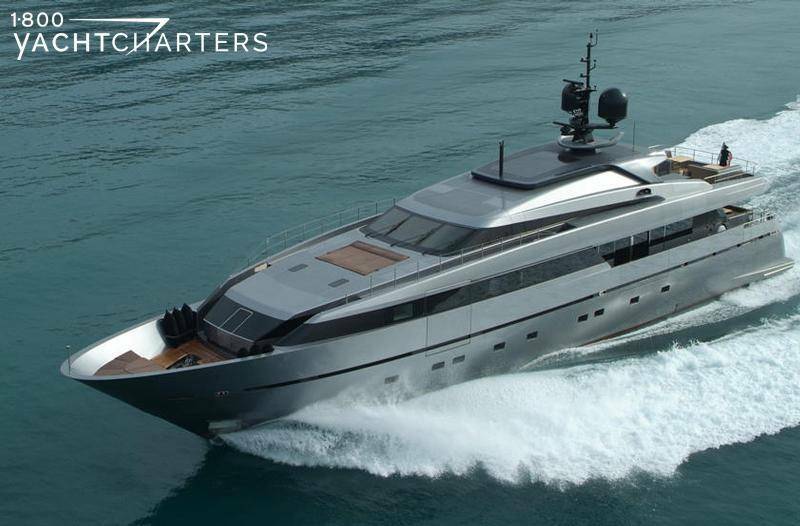 The motor yacht 4A wins prestigious award for luxury mega yachts. 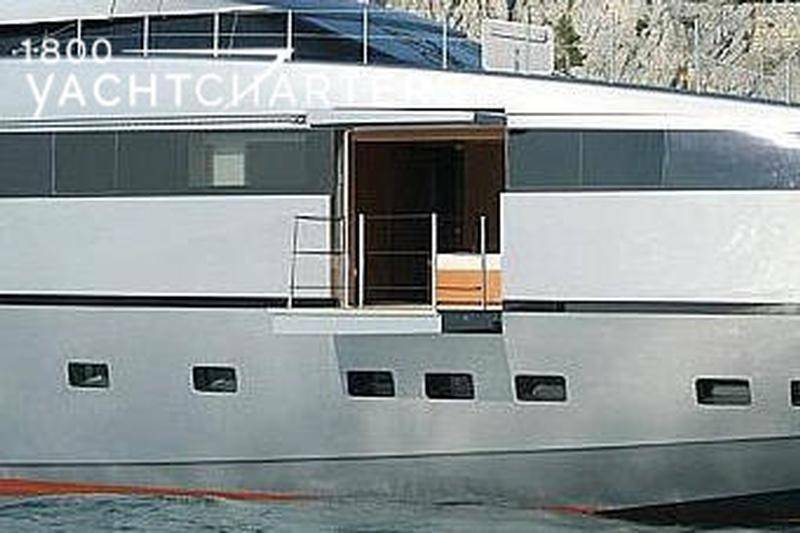 The magnificent 38.5 meter yacht 4A won Best New Series under 40 meters at the 18th Annual ShowBoats International Awards in Monaco in 2008. 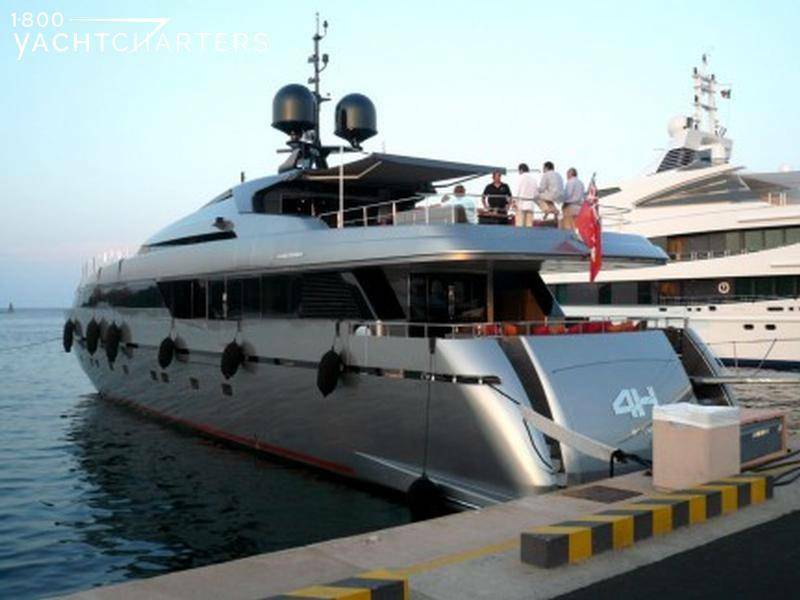 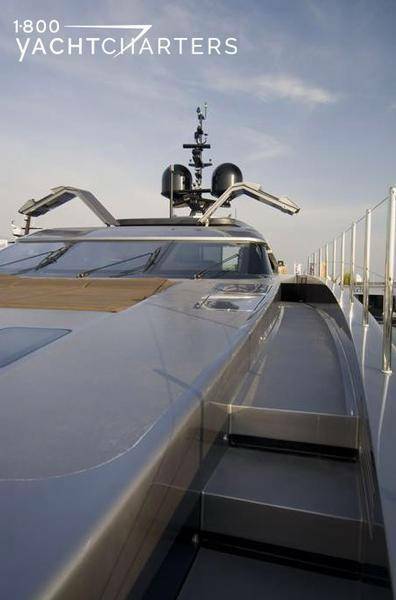 The annual ShowBoats International Monaco Rendezvous took place at Monaco’s Port Hercules. 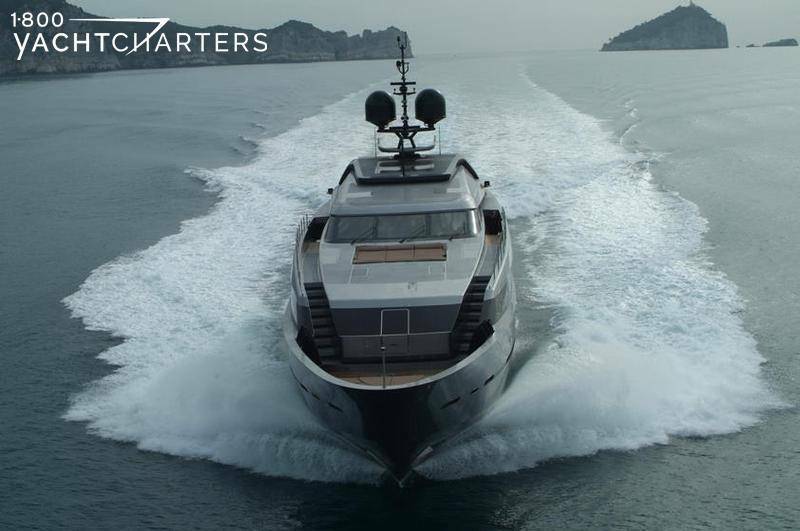 Throughout that prestigious show, the highly innovative mega yacht 4A was a true head-turner, with her modern lines, striking features and original design. 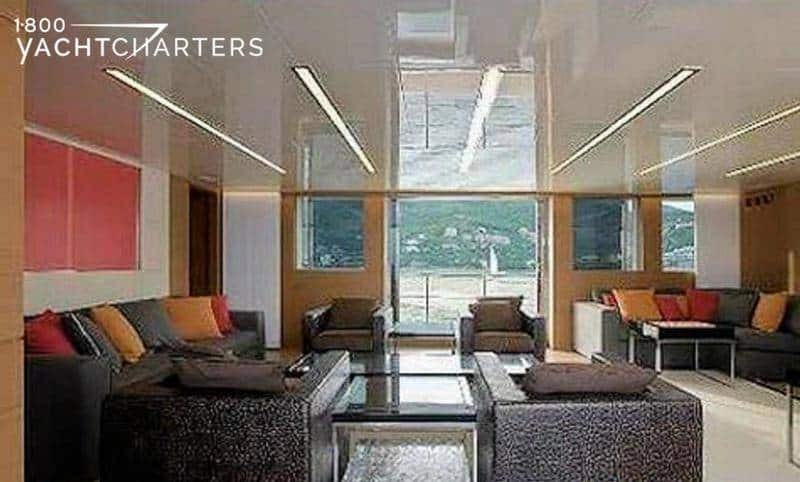 Featuring “sea terraces” on both sides of the main salon, master cabin, and gym, as well as 007-James Bond-like lifting gull-wing doors on the bridge deck, this luxury motor yacht charter vessel is a showstopper in every port. 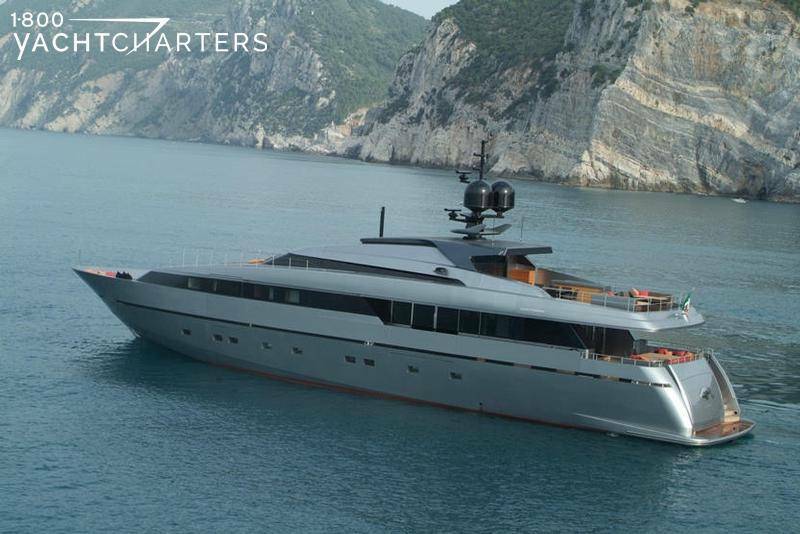 Built by San Lorenzo Yachts, the demand for this megayacht for a Mediterranean yacht charter is huge. 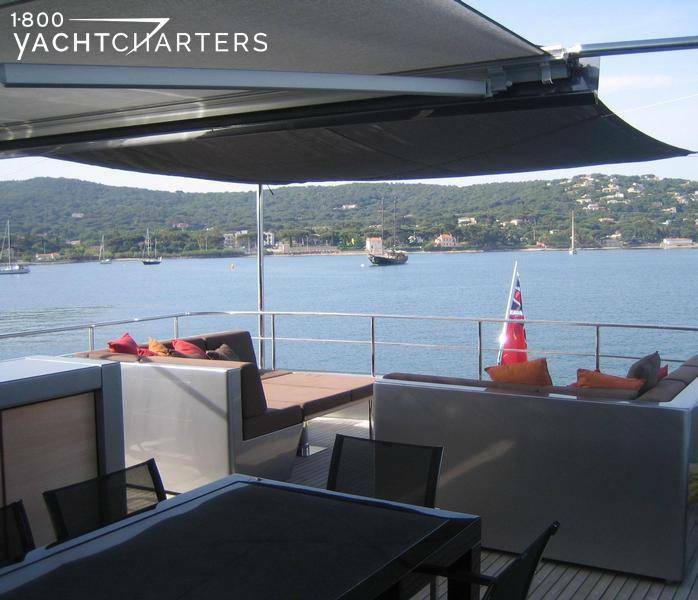 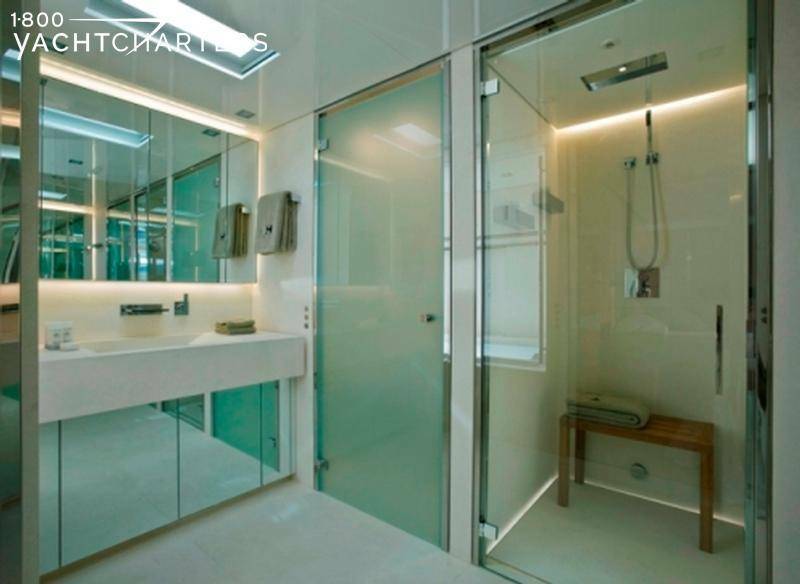 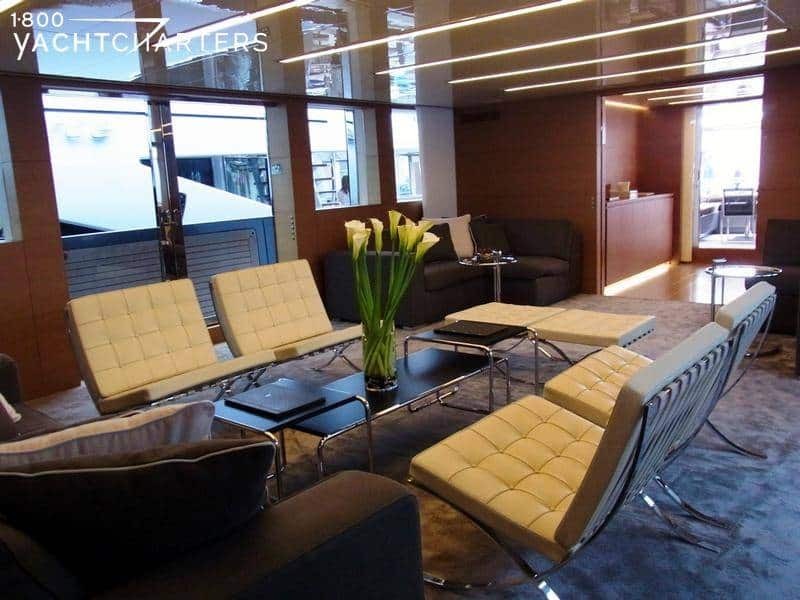 Offering contemporary good looks throughout her spacious and sumptuous interior and out onto her stylish aft and fly decks, this is the perfect luxury charter yacht for stylish chartering, be it a Croatia yacht charter, an Ibiza yacht charter, or a Cannes yacht charter. 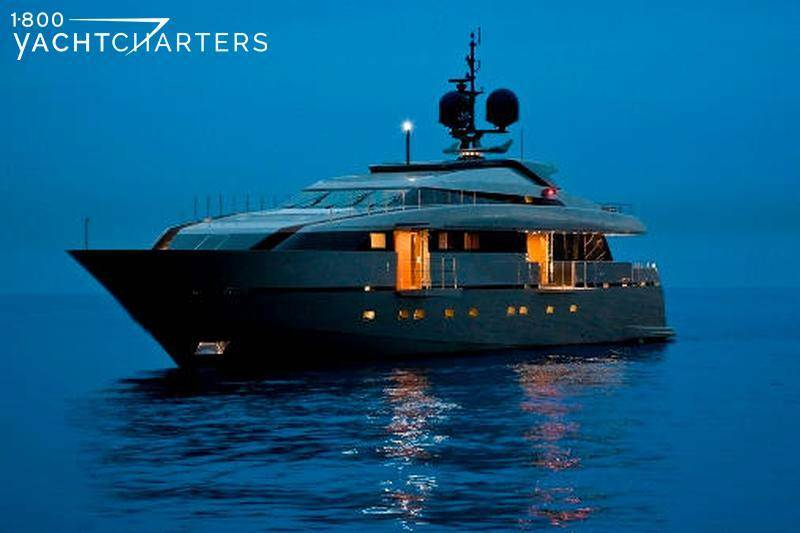 The Rendezvous began with a sparkling evening champagne yacht hop on the 25th June for ShowBoats International’s select guests. 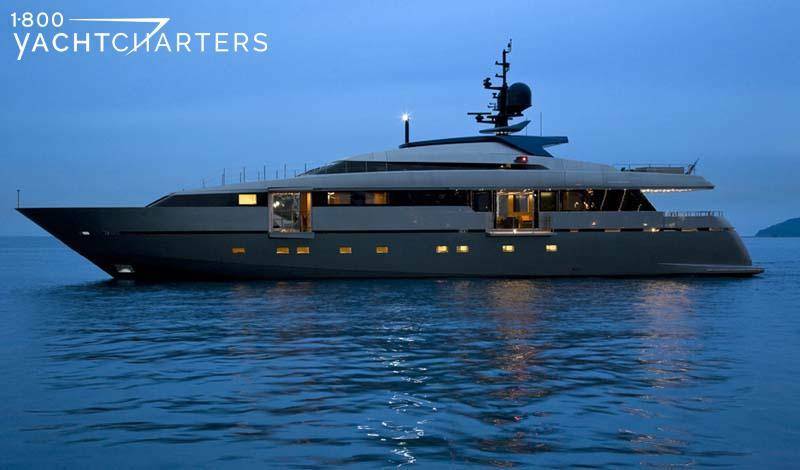 Then on the 26th June the glamorous awards dinner was held at the Monte Carlo Sporting where the owner of this mega yacht charter vessel collected his trophy. 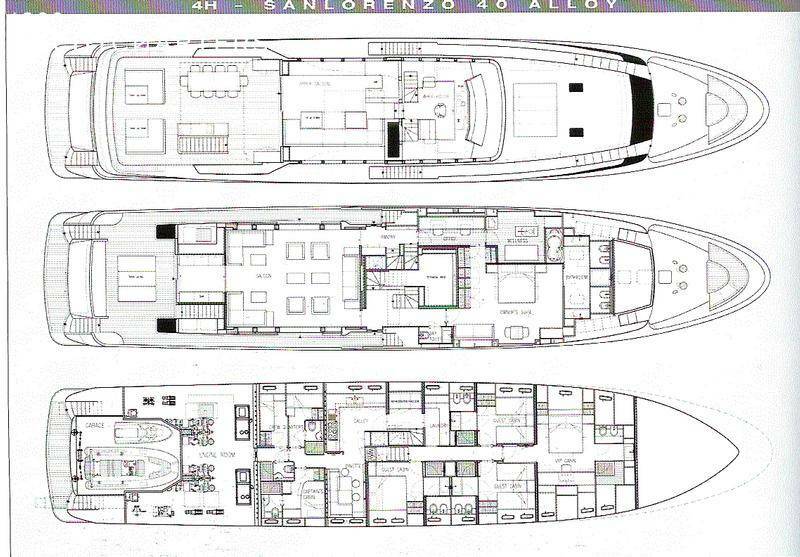 Her owner, Captain Frank Hess, and San Lorenzo Yacht’s director, Massimo Perotti and team represented the yacht. 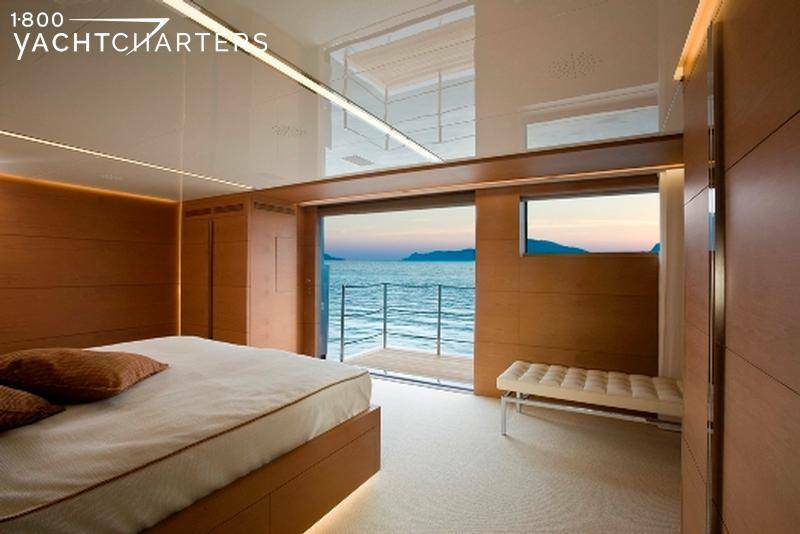 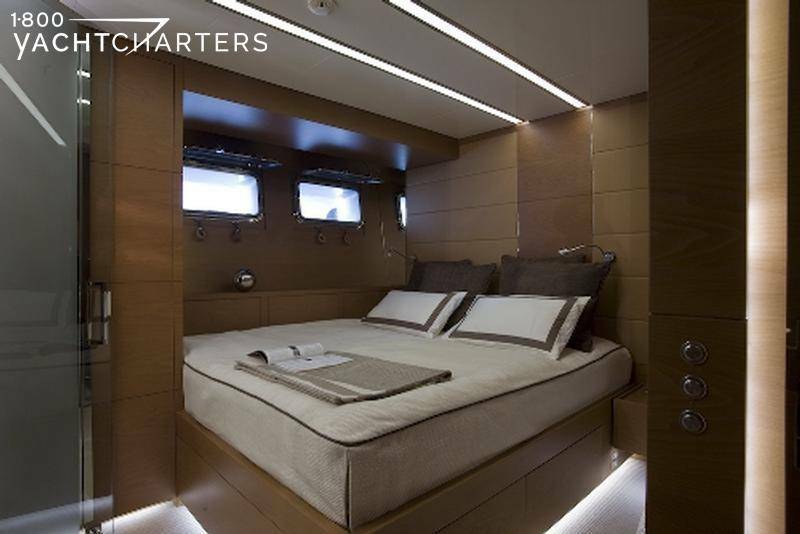 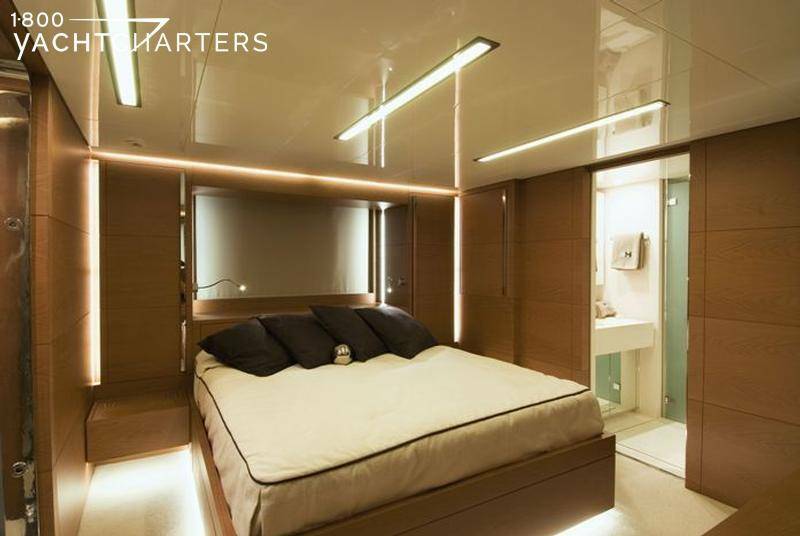 This megayatch sleeps 10 guests in 5 cabins. 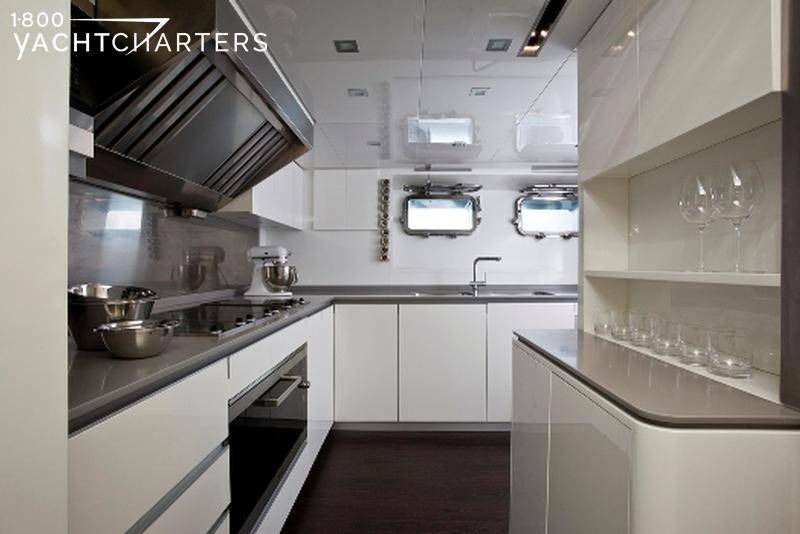 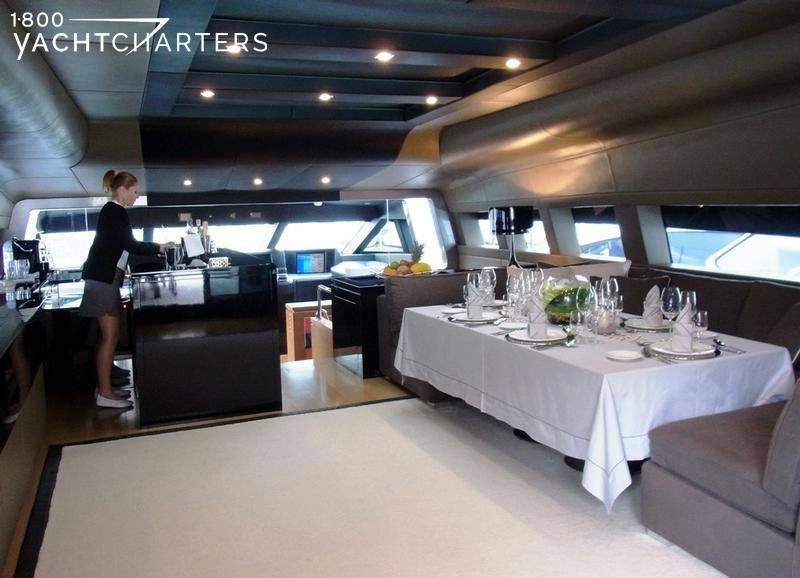 A professional crew of 6 serves Mediterranean yacht charter guests. 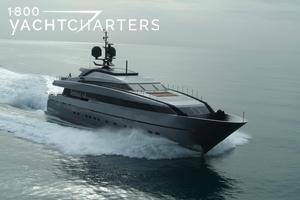 The vessel has a semi-displacement aluminum hull, which is capable of a cruising speed of 22 knots and is powered by 2 MTU 12V 4000 M90 engines. 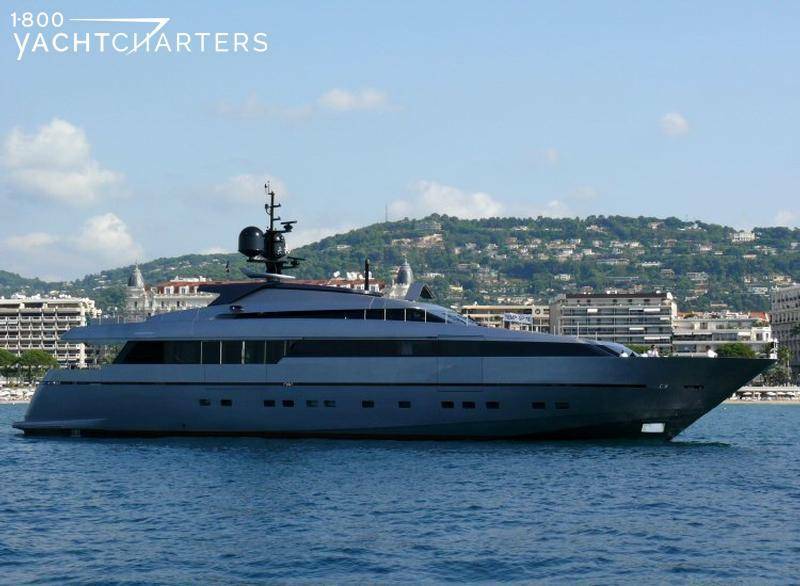 Able to move quickly and easily between beach and port, this new megayacht has great outdoor entertainment spaces including a fantastic sundeck as well as a stylish aft deck. 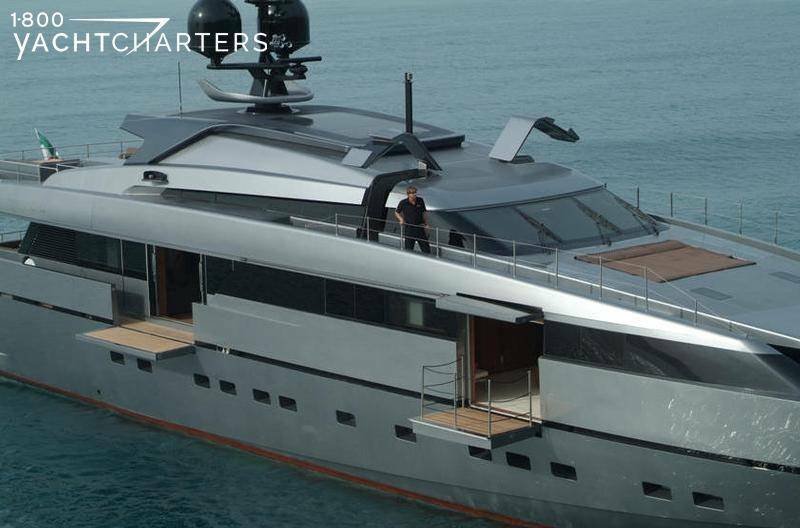 She also features a study, a gym, gull wing doors, a Kaleidescape audio/visual entertainment system, and sea terraces for al fresco dining. 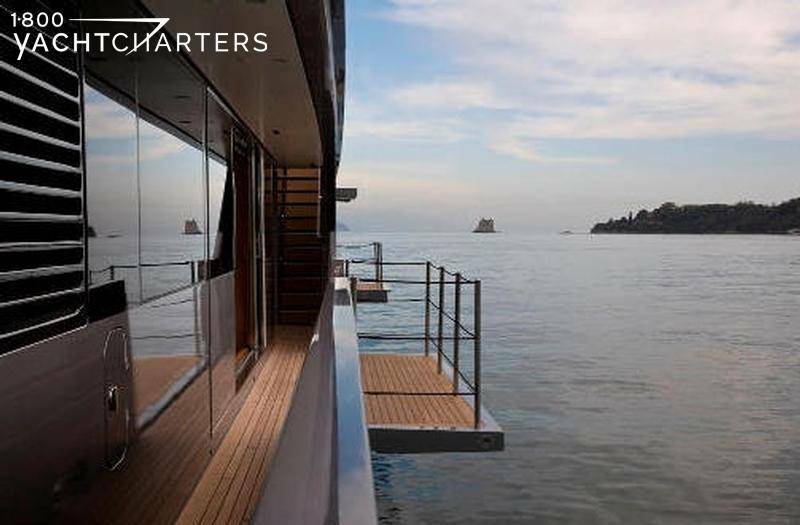 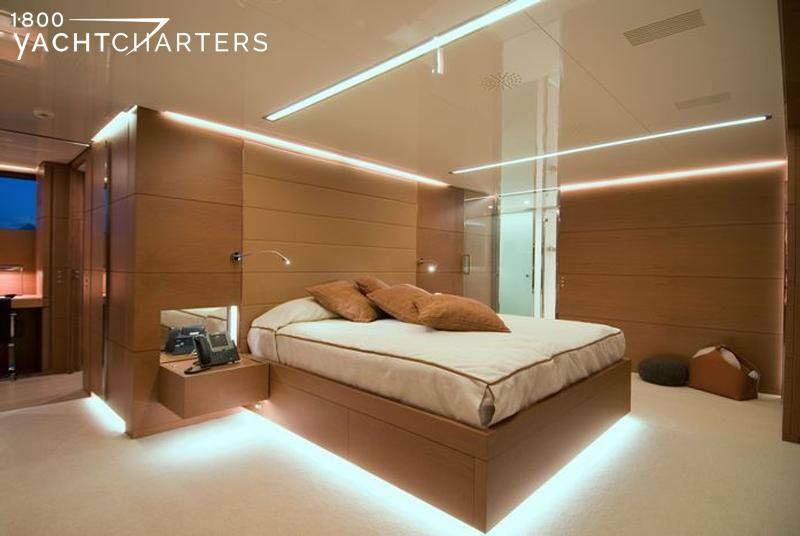 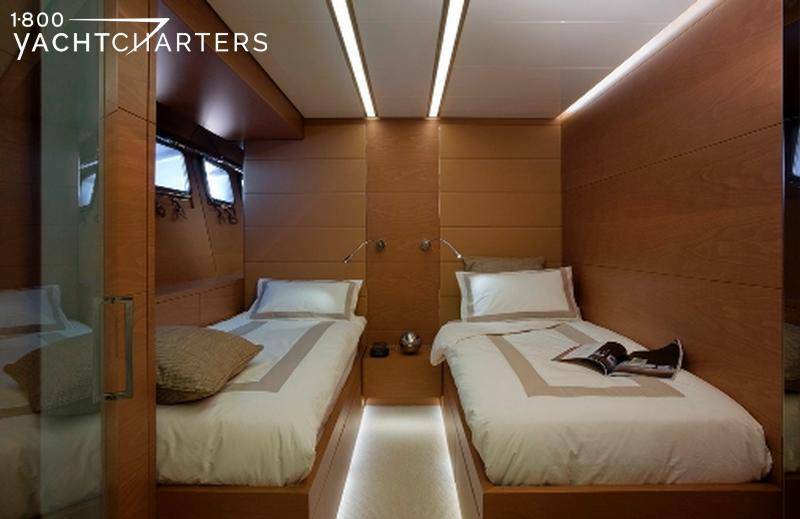 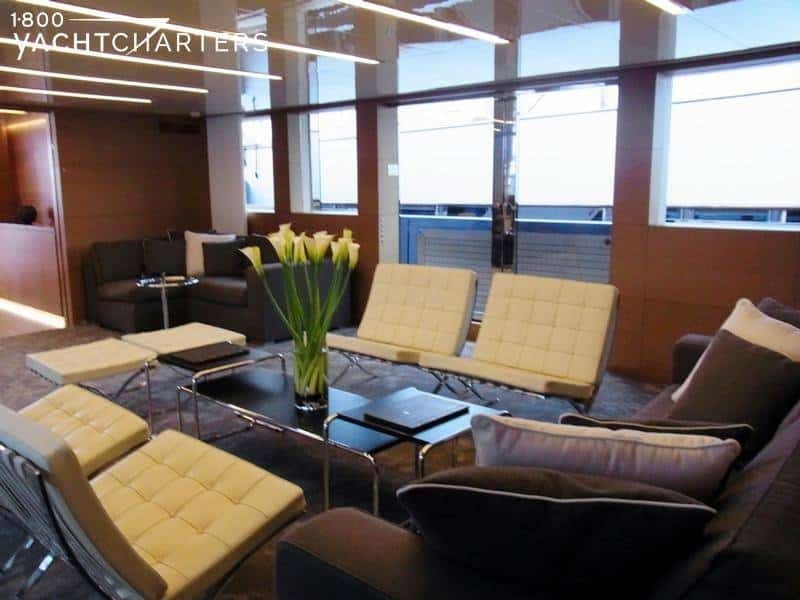 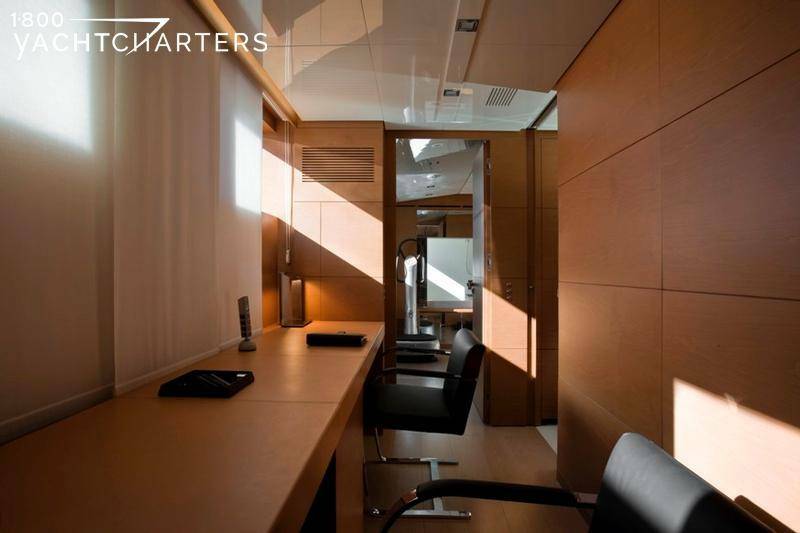 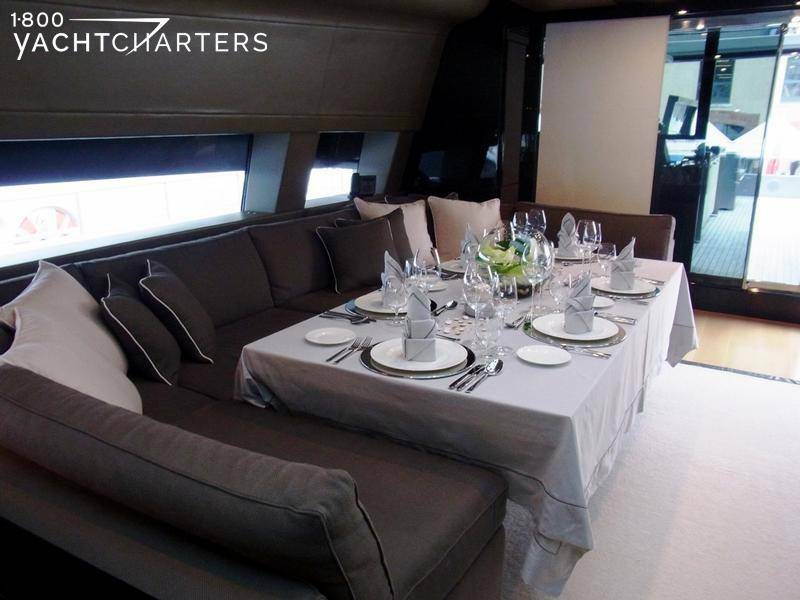 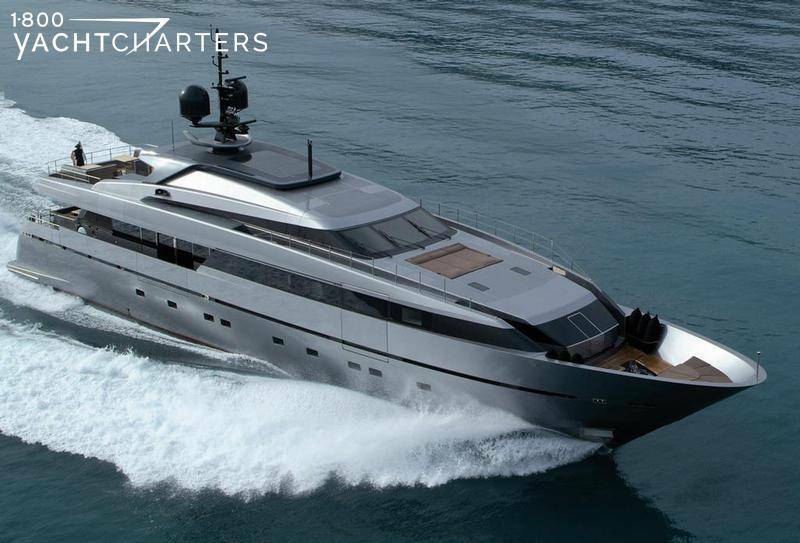 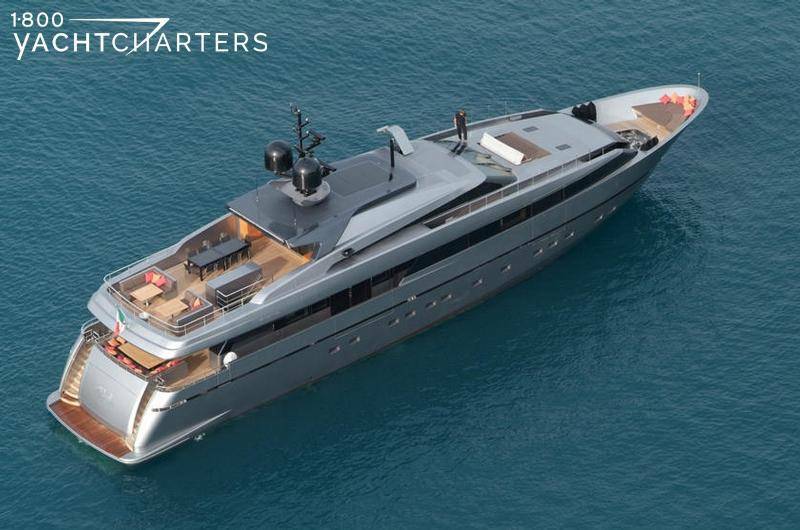 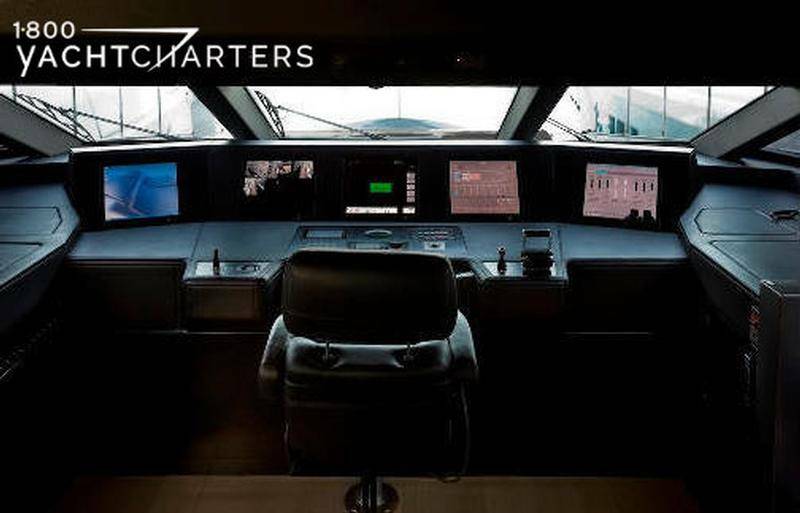 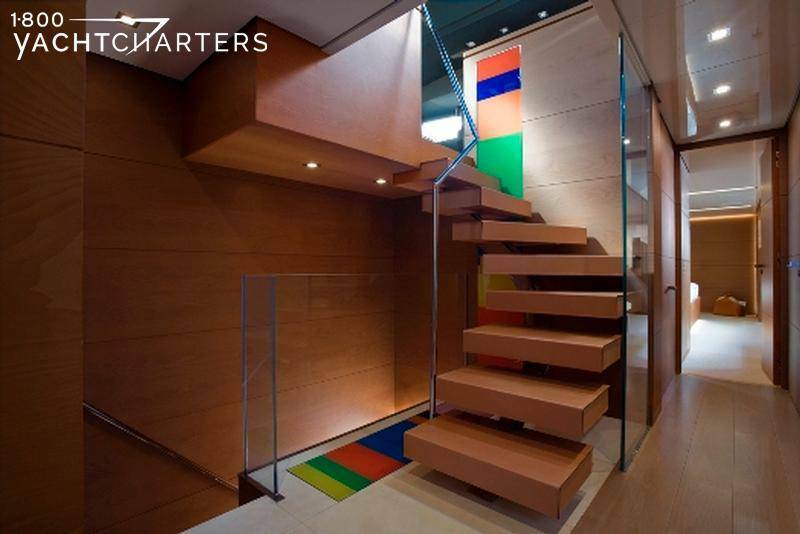 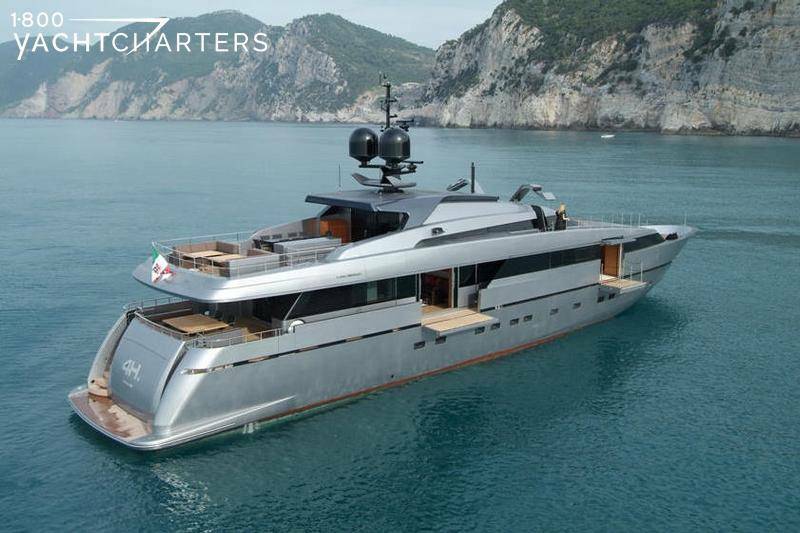 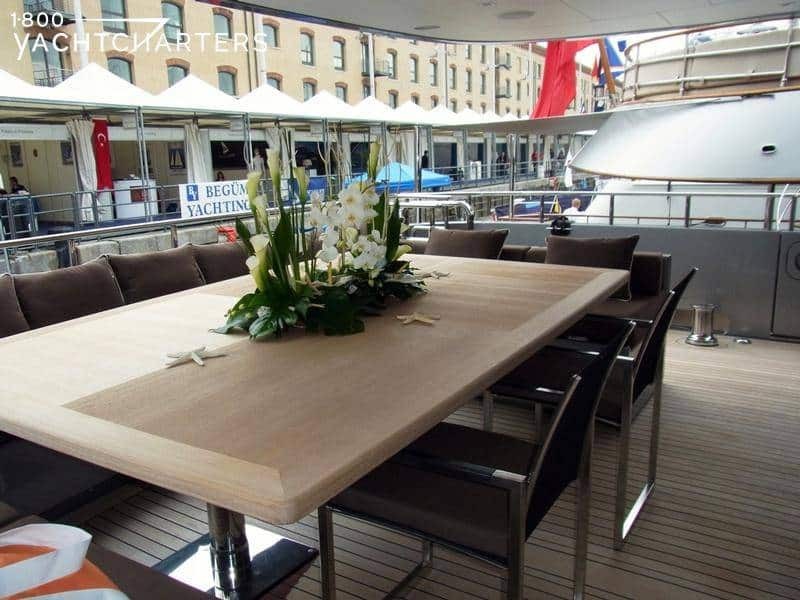 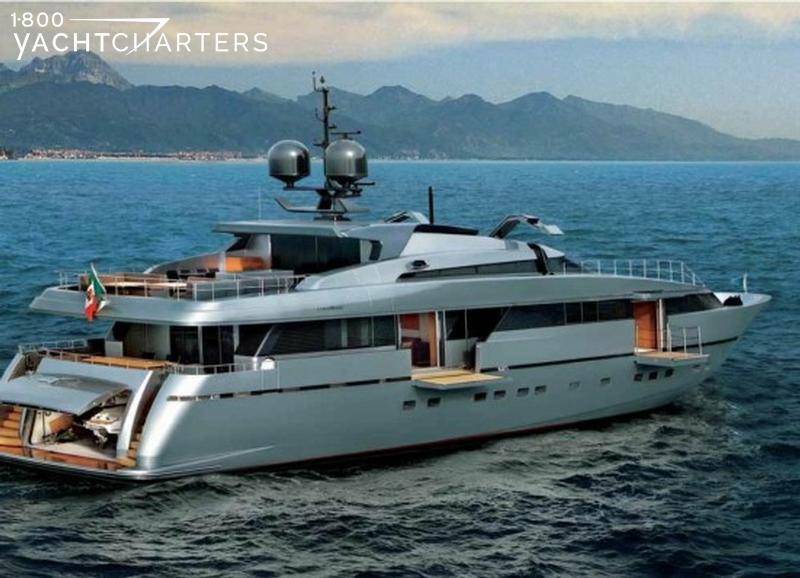 This charter yacht accepts both term charters (multi-night vacations) as well as static charters for special events such as MIPIM, Cannes Film Festival, and the Monaco Grand Prix. 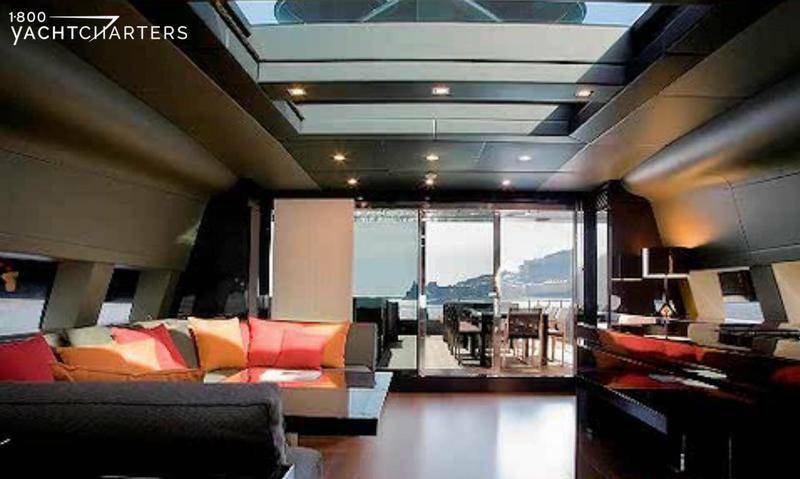 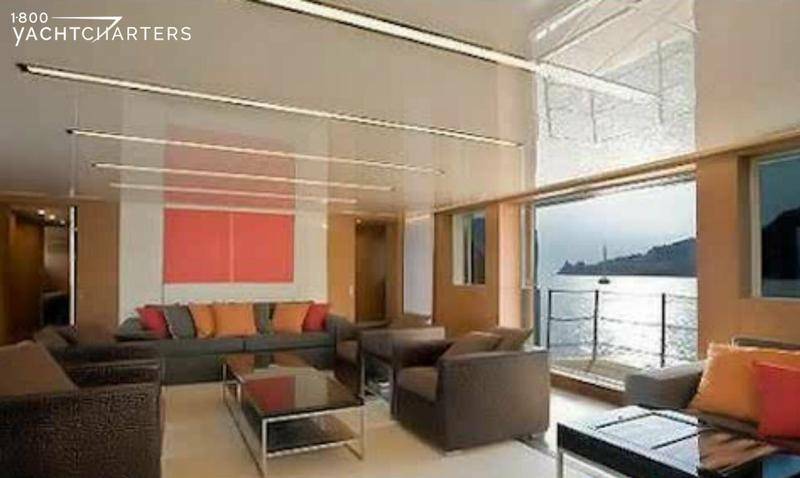 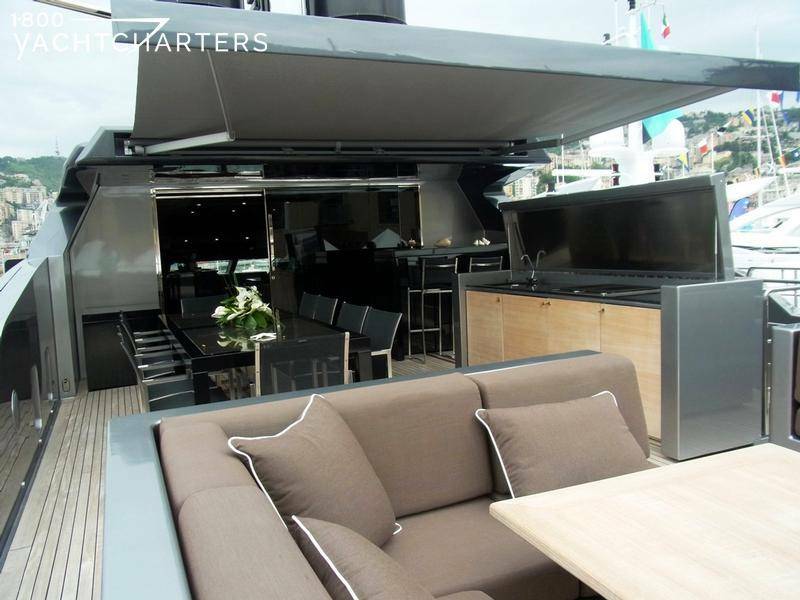 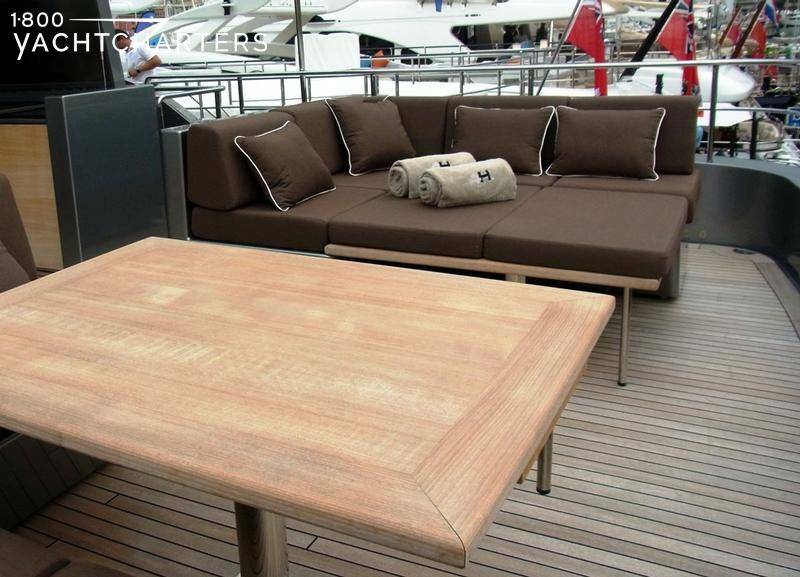 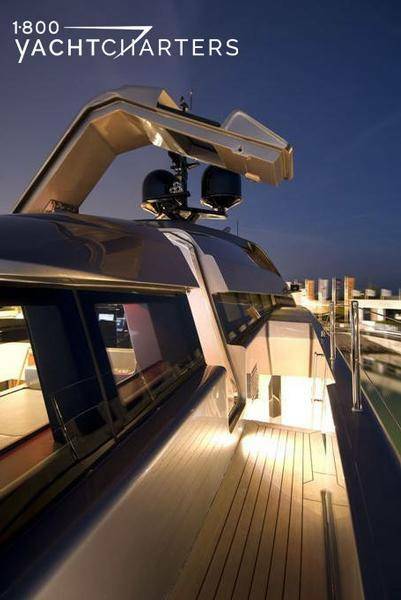 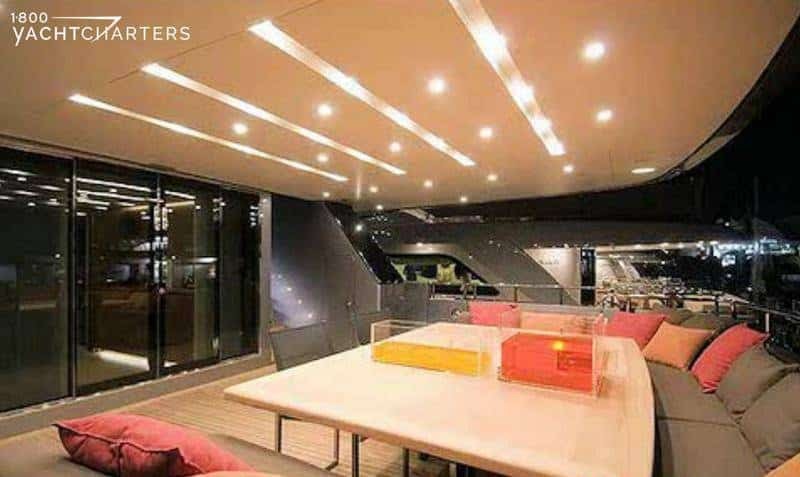 The open-air top deck of this megayacht is the perfect place to entertain celebrity attendees at the Cannes Film Festival. 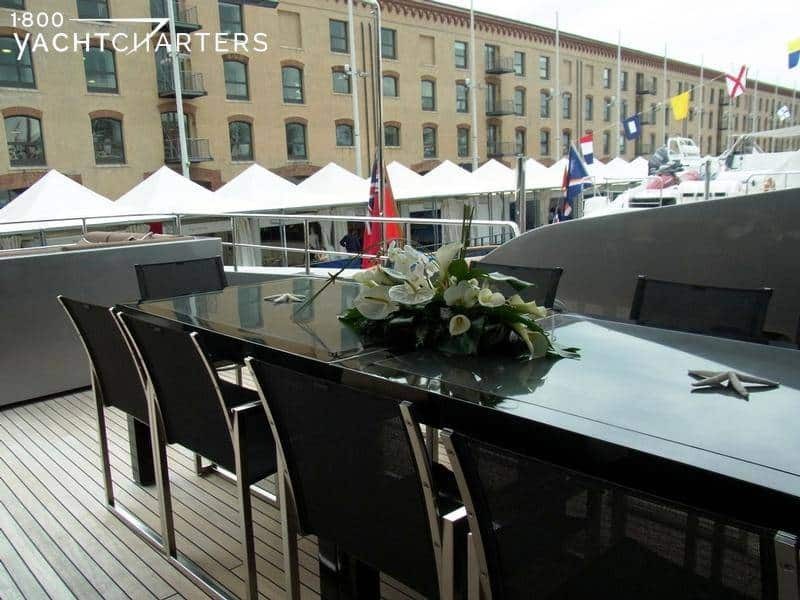 It is also a great viewing spot to watch the Formula 1 race cars zip around the streets of Monaco during the Monaco Grand Prix. 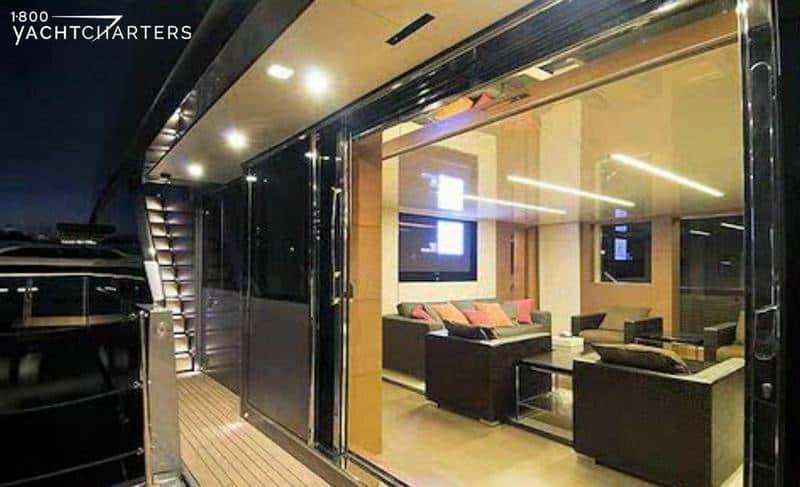 Tenders and toys include a speedy Novurania 5.30 meter tender with a 30 hp inboard diesel engine, a 3-person Yamaha VX 110 waverunner, 2 Sea-Doo underwater scooters, waterskis, wakeboard, and towable donut. 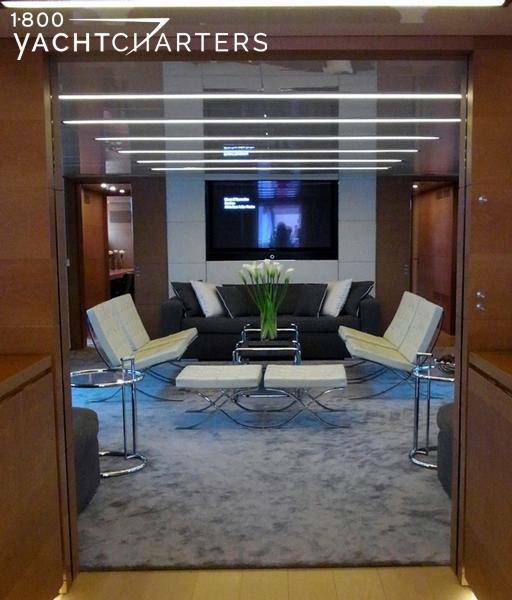 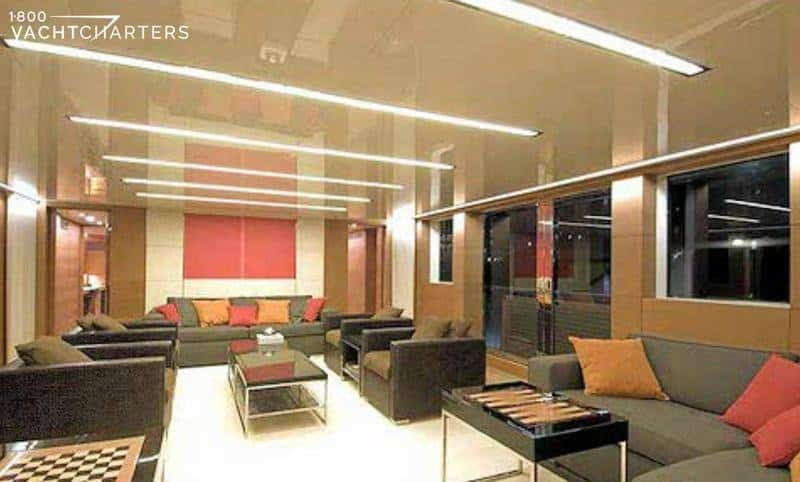 Audio-visual equipment provides music and movies to all decks, salons, and cabins. 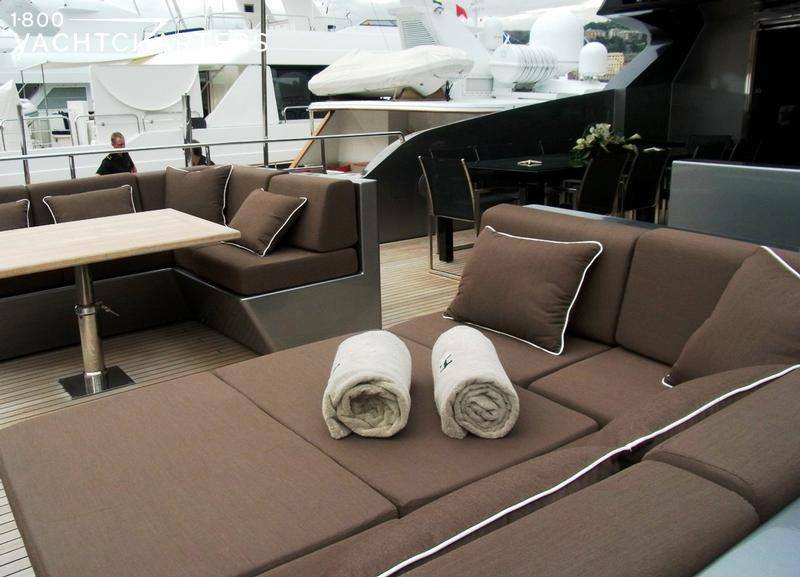 The Kaleidescape audio-visual entertainment system is unique in that it is programmed for all German channels, but with the flip of a switch can receive all English channels. 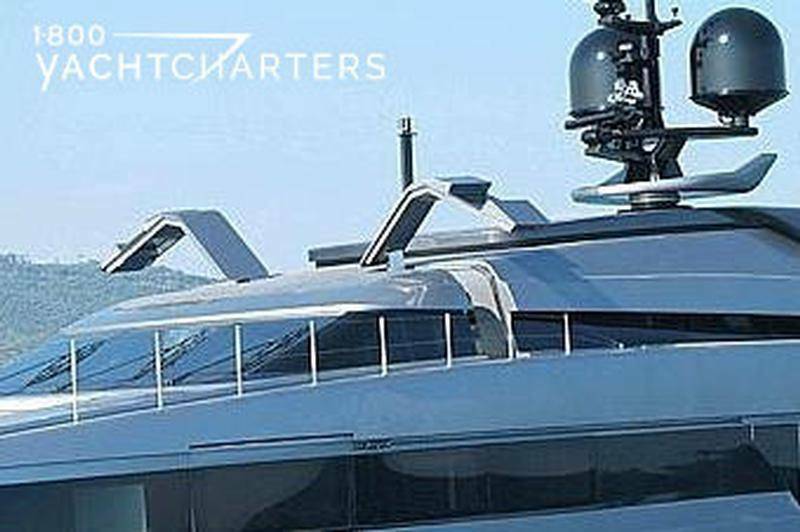 Communications is provided via a V-satellite system that offers high speed Internet, wifi, fax, and phone service. 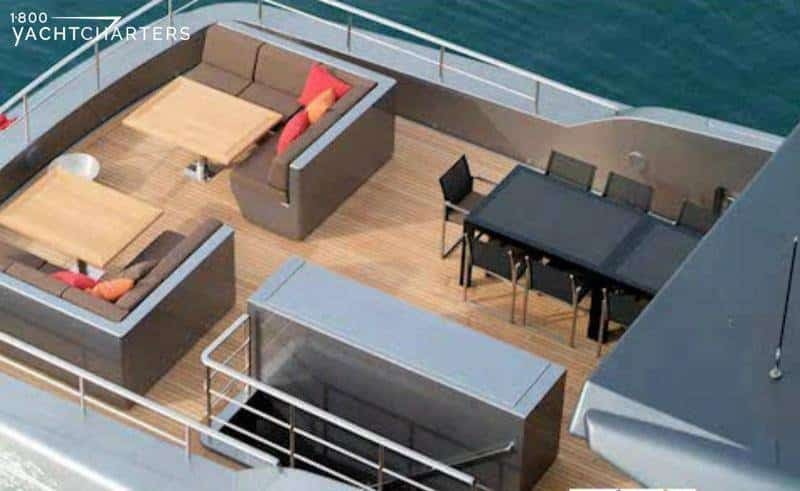 Approved RYA Water Sports Center in 2018.